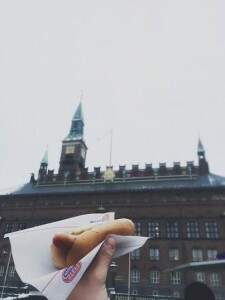 So excited to be in København! Delirious from the time change and from constant confusion in the city streets, I enjoy sunshine and coffee just down the street from DIS. Hot Dogs and architecture – two of my favorite things. In the first few weeks, I ate a hot dog for lunch probably more than I should have. Sodium levels increase, as does my excitement for the city. 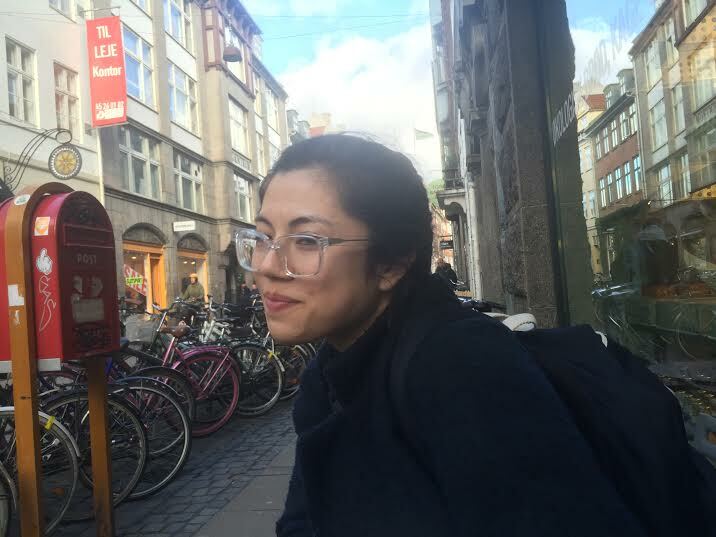 Core course week at DIS – my class (Sense of Place in European Literature) visits the North Atlantic House in Copenhagen, where we learn about Denmark’s colonial past, especially in Greenland. 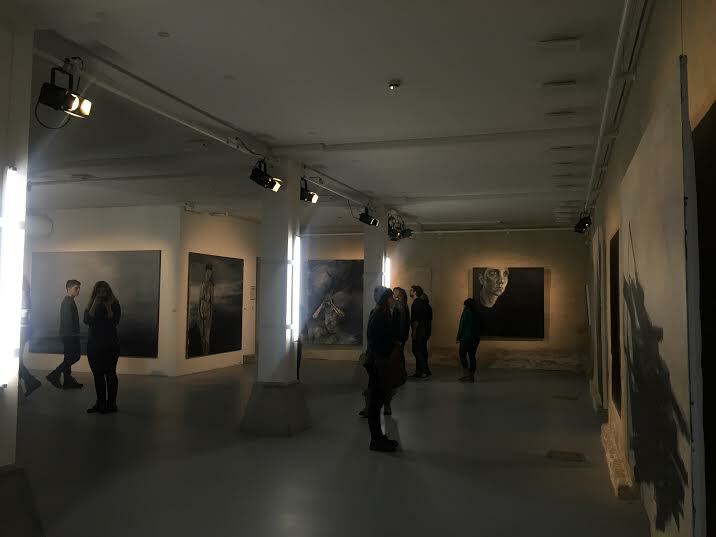 Inside we see a gallery of paintings done by an artist Greenland. She studies her anger and confusion as a Greenlander towards Denmark through her paintings. Core course week, again. 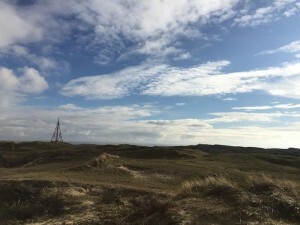 My class goes to Fanø a small island of the western coast of Denmark in the Warden Sea. The island is known for preserving their old folk traditions. While we’re there, we meet with a poet and a musician, and they teach us traditional folk dances. Here the beach is truly spectacular – as the tide goes out, the beach grows and you can walk out for miles. 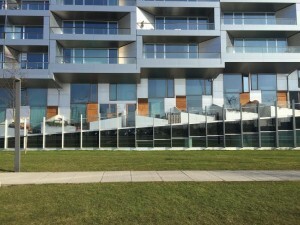 We visit a new kollegium (student housing) in Copenhagen for my 20th and 21st Danish Architecture class. It’s incredible. 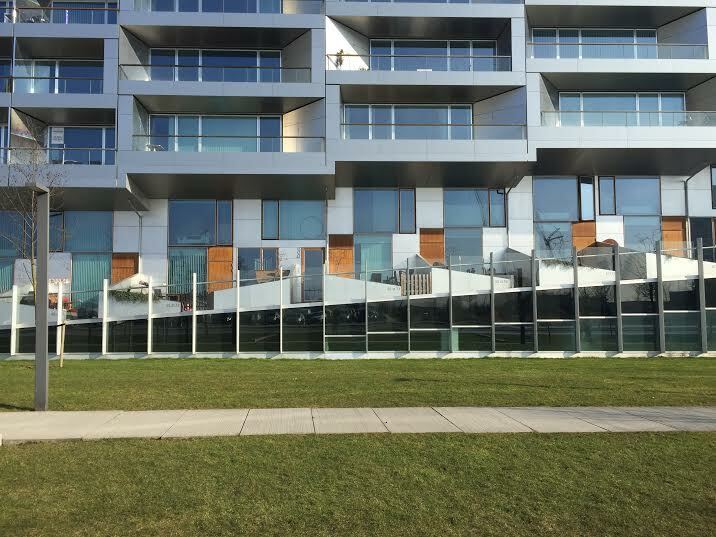 For my Surveillance Class, we visit the 8 House, a new housing development in Ørestad, one of Copenhagen’s newest neighborhoods. We study the use of glass on the façades of private households. That’s all for now! More to come. I intended to send out this post about three weeks ago, but despite my protests, time is flying by without abandon, and it’s now been over a month since I arrived in Copenhagen. These past few weeks have been humbling and thought provoking as my core course* delves into Denmark’s colonial past and present, and Europe’s current migrant crisis. It’s made me reflect on what it means to travel. Europe faces the largest wave of migration since WWII, and was deemed a crisis when a boat carrying about 100 people sank in the Mediterranean last year. Considering the magnitude of the current situation, the number of lives that the next few years, months, weeks will affect. The migrant crisis in Denmark is loud, yet incredibly silent. I see it and the rest of the city sees it, too – in the newspapers, on the tv, on the Internet. Yet it hasn’t much changed too many people’s daily lives. We still go to school, work, go shopping at H&M, watch our favorite TV shows at home. Some lives don’t depend on this discourse. Ultimately, it’s ubiquity lends itself to its invisibility. Because it is everywhere, it fades into the background, distant hum we can choose to ignore, apart of our landscape that can be cut from frames. And exactly this decision to choose whether or not to pay attention to this discourse which has opened my eyes more so to what it means to be privileged. For my core course, we went to an “asylaballet” called “Uropa!” a performance integrating ballet, interpretive dance, light shows, electronic music, and six men and women describing their experiences as a refugees, their journeys to Denmark. It’s hard to do the ballet justice with written descriptions. I left speechless, a mixture of sadness, anger, desperation, and awe. I felt useless, but at the same time I felt there was something I was missing, something I must be able to do to help the situation – but what? Now I wonder what it means for me. What does it mean if I can move freely through the space and throughout Europe, get a student visa, and take a place in Denmark, while someone who needs to leave their homeland, is forced from their past lives with the consequence of death, cannot? I’m not quite sure, but it’s opened my eyes to a lot. I’m enjoying myself immensely in Denmark (great food, good company, easy public transportation) but really, why am I here? It’s plagued me a lot these days. I love this country and the luxuries it’s afforded me. I love to walk around and experience all of the new sights and customs around me. Yet I can’t help but wonder, why do I travel? I think I’ll write about this more in the near future. Stay tuned. Another update on classes/trips soon to come! This entry was posted in Uncategorized on March 8, 2016 by Emma Philipps. Welcome to my first, fashionably late blog post! This Sunday marks the beginning of my fourth week in Denmark, and time is flying by (or as my Scandinavian professors might say, ‘time is running’). Today’s blog is going to be more of a recap, but look out in the next week for a prettier post! Saturday, Arrival: I arrived in Copenhagen on a very cloudy day. I was extremely disoriented from the travelling/time change/etc when I met my visiting family* for the first time. Walking out of customs with a herd of other DIS (Danish Institute for Study Abroad) students, we were greeted by dozens of Danish families waving and smiling on either side of the pathway. I saw my name on a big sign, held by a smiling group of people. I went over to them, quickly trying to remember all the do’s and don’ts of meeting Europeans. #1- don’t hug the europeans. I give every single member of my visiting family a hug as I meet them. They grin at me with nervous excitement and I do the same. Later they help me move into my kollegium** and take me out for a sandwich. Sunday, First Full Day: The DIS admin has the SRA (RA) of our kollegium, Grønjordskollegiet, put on a few ice breakers for the DIS students. We go on a scavenger hunt. I try to order a coffee in Danish. The guy behind the counter says “What?” I feel ridiculous. The coffee makes up for the minor embarrassment. Monday, Orientation: Another DIS sponsored scavenger hunt. Me and a few other students run around the city like chickens with their heads chopped off. Very cold, headless chickens. I took my group on the wrong bus three times. Had a nice hot dog. Tuesday: Went ‘out on the town’ for the first time. Stood in line at a bar. Thursday/Friday, First days of classes: Basically syllabus days. After changing a few things I end up with a pretty fabulous schedule – A Sense of Place in European Literature, Who’s Watching: Surveillance Art and Culture, Scandinavian Moods in Cinema, Danish Language, and 20th & 21st Century Danish Architecture. Pretty neat syllabuses. Stoked to read Bentham’s Panopticon, again. My visiting family invites me over for dinner. We eat Tacos. I drink a lot of coffee. I also try a lot of new Danish pastries that I can’t say the names of. They all taste like buttery bread and sugar – I can’t complain. I meet up with some Whitties at a bar called Taphouse, AKA the Baskin Robbin’s of beers (65 beers on tap!!!!!!!!) We reminisce and check in with each other. I’m a little homesick, but I’m glad to be in CPH. My visiting family invites me over for dinner. We eat Pizza. I’m less embarrassed to reveal that I’m an American to the Danes when notice how endearing they think Americans are. I join the DIS film club. We watch Lars von Trier’s “Anti-Christ.” Wow. It is raw as hell. They take us to Taphouse (65 beers on tap!!!!!!!) afterwards and buy us drinks. I finish my first presentation and my first essay. Phew. I still drink a lot of coffee. My visiting family took me to the Louisiana Museum of Art, which is up the coast from Copenhagen. The Louisiana has some really incredible artwork, but what’s most spectacular about it is the view. When we stop for lunch they insisted I sit in a place where I can look out to the sea. It’s a pretty typical Danish day as far as weather goes; cloudy, slightly chilly and a bit breezy. The dark waters move in rapidly under the wind, and against the grey sky the grass vibrates with color. Its incredible to be able to look out and see the horizon stretch on for so long – even though it’s only been a few weeks, I’ve already forgotten what it’s like to be able to see miles ahead of you. My visiting family buys me lunch. We have sandwiches and bubbly water. I’m grateful to slow down for a minute. *I’m not living with a host family this semester, but I have a family in Denmark that I will occasionally hang out with. **kollegium – basically a Danish word for Dorm. Open to all types of students. This entry was posted in Uncategorized on February 7, 2016 by Emma Philipps.